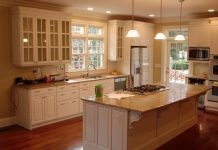 Family homes need to be both comforting and durable, and the kitchen is no different. As one of the busiest rooms in the house, you’ll probably find it’s the hardest to keep tidy and organized – after all it’s not just a kitchen, but often a dining room, utility room and homework office, too. Kids will hunt for snacks and pull things out of cupboards just as you’ve got it all ship-shape and tidy, and when the whole family is pitching in to do the dishes it can be difficult to move, leaving you thinking it might be easier just to do it yourself! 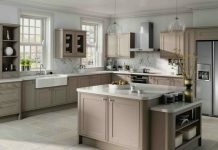 Thankfully, new trends in kitchen design focus on the social aspect of the household hub, meaning that there’s currently a wealth of inspiration out there. When you start thinking about what you want to achieve in your new kitchen, consider what you use it for the most – and be realistic! If you can incorporate your main kitchen habits into your initial design, whether it’s hoarding cookbooks or heating up leftovers, you can quickly piece together a kitchen that’s just right for you. 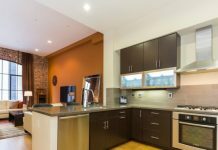 Do some research on manufacturers, too – plenty of online communities like this one are a fantastic source of information if you’re looking to have a custom kitchen built and installed. 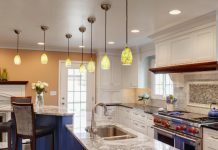 If you need some inspiration for your new family kitchen, check out some of our favorite ideas, based on the upcoming design trends for 2013 – hopefully this should give you some motivation to get started! Integrated appliances: Keeping your utility appliances such as the washing machine and dishwasher integrated with the kitchen is achieved simply by building cabinetry around them, and gives the room a far less cluttered appearance. 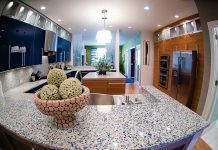 Island counters: A kitchen island is ideal for a family home if you have the space – It gives people somewhere to sit and talk while cooking or entertaining, and means that you can still help with studying while you’re doing other things. Islands can also look beautiful – take a look at some of these for more ideas! Family-friendly additions: Make your kitchen a welcoming place for the whole family by making it more accessible to the little ones – some of it, anyway! A step-stool and child-friendly drawer will encourage children to use the kitchen properly, without making a mess. Create a more family-oriented atmosphere by removing any televisions or screens from the kitchen – you want to turn it into a place where the family comes together, so use personalized decorations and things that will encourage conversation.